Throughout this week, I am listening to On Wenlock Edge, a setting by Vaughan Williams of six poems from AE Housman’s Shropshire Lad. This morning [7 March 2015], I am listening to ‘Clun,’ the sixth and final six setting by Vaughan Williams of these poems by AE Housman (1859-1936), published in 1896. Perhaps the moment most characteristic of Vaughan Williams’s attitude to life comes at the end of this cycle, when his evocation of the calm of death inspires a vision of the Celestial City – something that was to come again and again in his later works. Although this may be at odds with Housman’s grief and bitterness, Vaughan Williams’s mood of acceptance and fulfilment raises this cycle to a level of exceptional spiritual awareness. 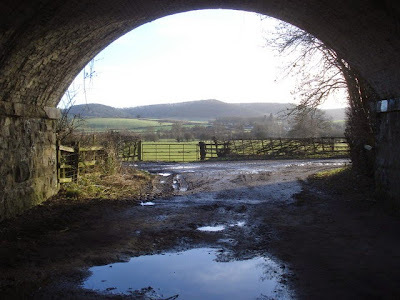 Housman was from Worcestershire and at first knew little of Clunton and Clunbury, Clungunford and Clun in south Shropshire, to the west of Wenlock Edge. The settings in this poem welled up from his imagination, and he wrote most of the poems in A Shropshire Lad while living in Highgate, London, before ever visiting this part of Shropshire, although it is only about 30 miles from his boyhood home. He presents Shropshire in an idealised pastoral light, as his “land of lost content,” and Housman creates a mythical, idealised Shropshire, similar to the Wessex of the novels of Thomas Hardy. He became so intimately associated with south Shropshire that when he died in Cambridge in1936 he was buried just outside Saint Laurence’s Church in the market town of Ludlow, which stands on a cliff above the River Teme. Housman’s “Famous Four” in the beautiful Clun Valley can be reached in one long day’s walk along the Shropshire lanes and their verges. 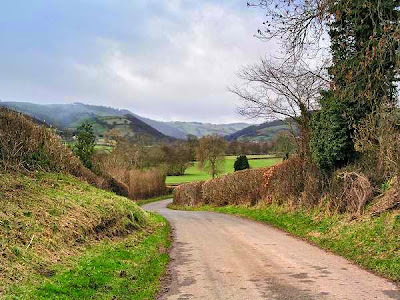 They sit in the beautiful Clun Valley in the Clun Forest, although visitors may be confused, for the Clun Forest has few trees and the name “Forest” refers to the area’s mediaeval use as a Royal Hunting Forest. Clun is surrounded by the Shropshire Hills Area of Outstanding Natural Beauty, close to the 1200-year-old Offa’s Dyke and the Offa’s Dyke Path, a 177-mile long National Trail. Clun Castle overlooking the town is said to have inspired Sir Water Scott when he was writing The Betrothed. The town is divided in two by the 15th century Packhorse Bridge, which has alcoves so people crossing on foot can avoid being trampled by the horses. The ancient part of Clun stands on the south side and the newer Norman town on the north, all set in the idyllic Clun Valley. Near Clunton, the fort on Bury Ditches Hill, with its ramparts and ditches towering above the slopes, has been described as one of the finest hill forts in Britain. Neighbouring Clunbury celebrated the centenary of Housman’s A Shropshire Lad in 1996 with an 1896 weekend. As part of the programme, Christopher Train of Holland House, Clunbury, spoke in Saint Swithin’s Church on Clunbury at the time Housman wrote this poem. Housman described these neat and quiet Shropshire villages as “the quietest places under the sun.” By 1896 this was certainly true for Clunbury, which had lost its pub – The Raven or Pig and Whistle, which is now Dutch Cottage with its thatched roof – after the last tenant, James Harding, died in 1879. He notes that the Revd William Jellicorse retired as Vicar of Clunbury in August 1896 after 40 years. That year, Matins were said daily in the Parish Church at 10 a.m., there were two or three services each Sunday, and one of the highlights of life in Clunbury was the annual entertainment of the choir and bell-ringers. Clungunford in south Shropshire is near the border with Herefordshire. Saint Cuthbert’s is the village parish church and the Rocke Cottage, formerly the Bird on the Rock, was named by the UK Tea Guild as Britain’s top tea place in 2011. Knighton, which also features in this poem, is a small market town about seven miles south of Clun. It stands on the River Teme, straddling the border between England and Wales, so that the main part of the town is in Powys, within the historic county boundaries of Radnorshire, while a small part of the town is in Shropshire. Knighton-on-Teme is a village in the Malvern Hills District in Worcestershire, about 14 miles east of Ludlow. It too stands on the banks of the River Teme.